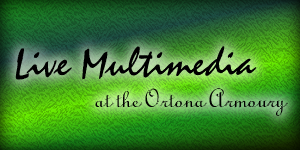 The Boreal Electroacoustic Music Society (BEAMS) will present an evening of electronic and experimental music in a cabaret setting at the Ortona Armoury (9722-102 Street) Saturday, February 25 at 8 p.m. The show features new works by Shawn Pinchbeck, Don Ross, I-165, Reinhard von Berg and the Electroplankton Orchestra. I-165's Cam Johnson will present ambient improv with samplers, processors, mics, mixing boards, a keyboard and visuals. Don Ross and friend will improvise live over electronic paraphrases of Messe Blanche by André Cormier and the Oxyrynchus Manuscript, a third century Christian hymn. Matt Schneider and Martin Hicks of the Electroplankton Orchestra have a set based on the Nintendo DS game Electroplankton by Toshio Iwai. The game has no actual goal or way of winning; it was created solely to make music. Reinhard Berg has reached into his archives of electroacoustic music on tape. Shawn Pinchbeck, newly returned from graduate study in electroacoustic music in Birmingham, will be showcasing his new material for laptop and video. Tickets are $7, $5 for BEAMS members, available only at the door. For more information, e-mail info@beams.ca.